Ingredient of the week: cabbage – and a Food Revolution Day giveaway! When I was a kid, my dad did a fair bit of overnight traveling for work. I always knew my dad was on an out of town road trip when I smelled the unmistakeable odour of cabbage being boiled for dinner. My mom and granny loved it; my dad couldn’t stand even the smell of it cooking. I therefore called it a victory of considerable magnitude when we had my folks over for dinner recently and he not only didn’t hate the cabbage side dish I’d made with meatloaf – he actually liked it. But you know what I love the very most about cabbage? You can fry it up with bacon, garlic and onions and have the world’s best side dish. My friend Danielle recommended this recipe not too long after Christmas and I’m sure we’ve had it at least twice a month, maybe more, ever since. The smell of garlic and onions frying in rendered bacon fat is a thing of beauty, and despite being fried in bacon fat the sheer volume of low-calorie cabbage turns this dish into a reasonably nutritious, low-calorie AND flavourful option. This is the dish that I want to cook up for Sobeys #PotluckChallenge for Jamie Oliver’s Food Revolution Day! So, back to the recipe – I streamlined and tweaked it a bit from the link above. Here’s how it rolls in my kitchen. Chop up three, or six, or however many you have available, strips of bacon and set them up to cook in a really big pot over medium heat. While the bacon is cooking and rendering, spend an inordinate of time cursing and trying to peel several cloves of garlic (seriously, there must be a trick to peeling garlic that I am missing. Help?) and decide that three cloves is better than the six you were aiming for, and chop that up with half an onion or so. When the bacon is mostly crispy, about 10 minutes or so, pour most of the fat into a jar without pouring it all over the outside of said jar (I am still perfecting this part) but don’t be too fussy about getting it all out. 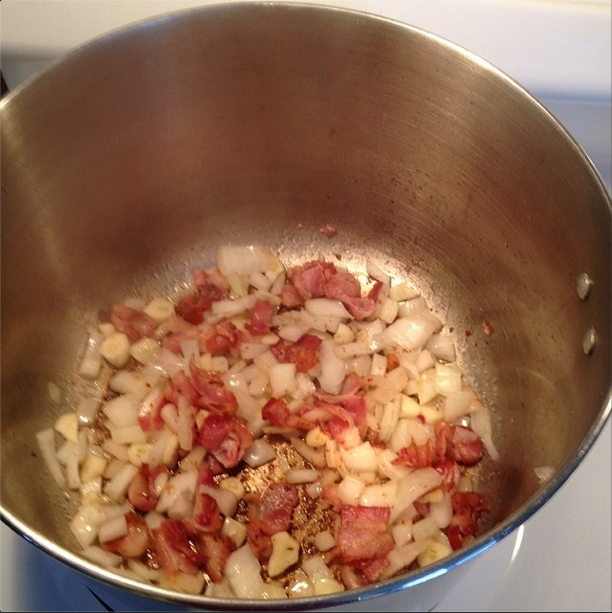 Put the pot with the bacon and a little bit of the fat back on the burner and dump in the garlic and onions. Give it all a good stir and wait for the magic. While you are waiting for the alchemy, cut up the cabbage and swear that one day you will replace the ridiculous child’s toys that are your kitchen knives. I cut mine into strips that are small enough that they aren’t coleslaw candidates but not so large I can’t stuff a lot of them into my mouth at once. Avoid the core of the cabbage – you’ll have more than enough to fill your pot, trust me! Right about now take a deep whiff of the heavenly aroma that is the garlic and onions carmelizing in the bacon fat. There is no smell better in my kitchen, ever. Once the onion becomes translucent, maybe 5 or 7 minutes, start dumping the chopped-up cabbage into the pot. I dump some in and then use tongs to mix the cabbage in with the garlic, onions and bacon, then add more cabbage and mix some more, until the pot is full or I run out of cabbage. Despite the recipe, I usually only add a smallish pinch of kosher salt and that’s all – I find the bacon plenty salty and the onions and garlic give it all the flavour it needs. If you perchance have burned the bacon to the bottom of the pot, which never happens to me regularly, don’t worry! Put a lid on the pot when you’ve crammed in as much cabbage as it can hold and let it stew in its own juices for 10 or 15 minutes, stirring frequently with tongs or a big spoon. The juice from the cabbage will soften up the flavourful burnt bits and you can scrape them into the mix as you’re cooking. Take the lid off the pot for another 10 to 15 minutes of cooking and you’re done. It is one of my favourite side dishes (goes great with meatloaf or any BBQ meat) and it’s even better by itself for lunch the next day, cold or warmed up. Best part? The kids eat it!!!! Since I loved that dish so much I thought I would love this easy variation on the same theme – cabbage wrapped in bacon and grilled in foil on the BBQ. But meh, it was not worth trying a second time. I did expand my cabbage repertoire to include homemade coleslaw last week, though. I’ve always liked coleslaw but hate that the storebought versions have so much sugar and other things I can’t identify. This vinegar coleslaw recipe was fairly easy and I liked the tangy-ness of it. I’m open to suggestions, though – got a family favourite coleslaw recipe to share? I personally like mine on the oil and vinegar side of the spectrum, but I am not opposed to a creamy recipe if its a keeper. Do you cook cabbage? I’d love to hear your favourite recipe or tips! And now for the giveaway part! Thanks to our friends at Sobeys and their Better Food for All campaign, I have a $50 Sobeys gift card to share with one lucky winner. You could buy a lot of cabbage at Sobeys for $50, I’m just sayin’! Want to win? Leave a comment on this post telling me what your favourite dish is to bring to a potluck. Or are you the one who volunteers to bring the plates and napkins? This is a giveaway for one $50 gift card for Sobeys. To enter the giveaway, simply leave a comment on this post (not on Facebook, must appear on danigirl.ca/blog) telling me your favourite dish or item to bring to a potluck. This giveaway will run until 11:59 pm EDT on Friday May 9, 2014. If you win, you must be willing to provide your full name and address to me so I can mail you the gift card. I actually have a killer meatball recipe that I keep getting asked to bring. You may actually have inspired me to buy a cabbage. Anything with bacon has to taste okay, even if cabbage IS involved. I have 2 go-to potluck dishes – one is a curried lentil/currant salad (that we use more often as a dip with nachos!) and the other is a mini-bocconcini cheese, grape tomato and chickpea salad that I can make in less than 5 minutes and tastes fabulous! ugg…typo: (Writes a fan of yours…. I’m a desert person so I always bring desert. My carmel apple dip is always a fan favourite at pot lucks. I always bring some kind of gluten free mini cupcake so I know that there will be at least one dessert I can eat 🙂 I’m all about coconut flour these days, and I’ve found a coconut flour vanilla cupcake recipe that makes all but the fussiest of eaters happy. Ps – Brussels Sprouts with your bacon/onion mix also are amazing. It’s become a staple at our house – We don’t even do the bacon/onions first now. We throw the bacon, onions, garlic in a roasting pan, with a chicken/chicken breasts and put in the oven to roast. At about the half-way point (depending on how big your chicken is or if you’re using chicken breasts, which cook faster) we toss in the brussels sprouts, and it’s an easy one-dish delicious dinner. I love cabbage, but sadly, cabbage does not love me. I am looking at your bacon and cabbage dish with great envy. Sigh. Potlucks: I usually bring about 10 dishes to a potluck, because my family has so many food allergies I always want to make sure there is something for them to eat. An absolute must is to bring desserts – I always bring egg-free, milk-free, nut-free cookies, and usually cupcakes and a pie, too. For a main course I have a really good lentil dish I usually bring because my vegetarian husband needs to have something to eat. GAH, are we the worst guests ever, or what? I usually bring a pasta salad or meatballs. I often bring a dessert because I happen to like dessert. I usually make an oven rice dish my mom has been making since I was little. Or meatballs cause easy and everyone loves meatballs! Finely shredded red cabbage goes on all the tacos, especially fish tacos! Slice Savoy cabbage, sear, and dress like a steak with a salad dressing. Top with granola. I like a touch of pickle but not mayo in my coleslaw, so use the pickling liquid from a batch of Vietnamese carrot pickles. Lady, I friended you and follow you on FB. Anything more and it’d be stalking! I make a mean homemade pizza – i think that is what i would bring! Thanks for the contest! And thanks to Sobeys for providing the prize!! Fav. potluck contribution is Caesar Salad – make a homemade dressing that friend gave me a recipe for years ago. Never any leftovers. Re. peeling garlic – turn chef knife on it’s side on top of clove and smack with side of your fist, skin pops almost right off. Alternatively do as chef Jamie does and just put clove in garlic-press skin and all – no peeling or chopping necessary! My go tos (plural) are pulled pork and broccoli slaw or a broccoli salad! People always ask to bring my famous baked brie with toasted almonds and maple syrup to potlucks. It’s super easy to make and a real crowd pleaser. Don, I want your devilled egg recipe. For me, potato salad is a go to and I found a great recipe a couple of years ago that I love. Smash your garlic clove with the side of your knife. the skin will come right off. add a glug of wine and the brunt brown bits come right off the bottom of the pot. i usually bring my cheesy artichoke dip (which has an insane amount of garlic) and GF crackers. Come to think of it, we haven’t had a potluck in a while. gotta fix that. oops, forgot to add I’m an FB fan, of course. I make a mean spinach dip that everyone loves. That is my fave to bring to potluck. I also follow on facebook now. Next post: Guess which blog is featured in Capital Parent Newspaper?